Sometimes it’s a little hard for me to even wrap my mind around how much my running injuries have spiraled out of control since October of 2013 when I toed the line at the Marine Corps Marathon with a funny, sporadic shooting pain in my right ankle. The truth is that I probably had no business running that race – I knew something wasn’t right…I just wasn’t sure what. The night before the race (well, at that point it was technically race day), I wasted valuable sleep pacing the halls and worrying about whether I should be lacing up my racing flats in the morning. But I had put in the miles and the hard work, and I felt 99% sure that my goal of running a sub-three-hour marathon was in the bag. 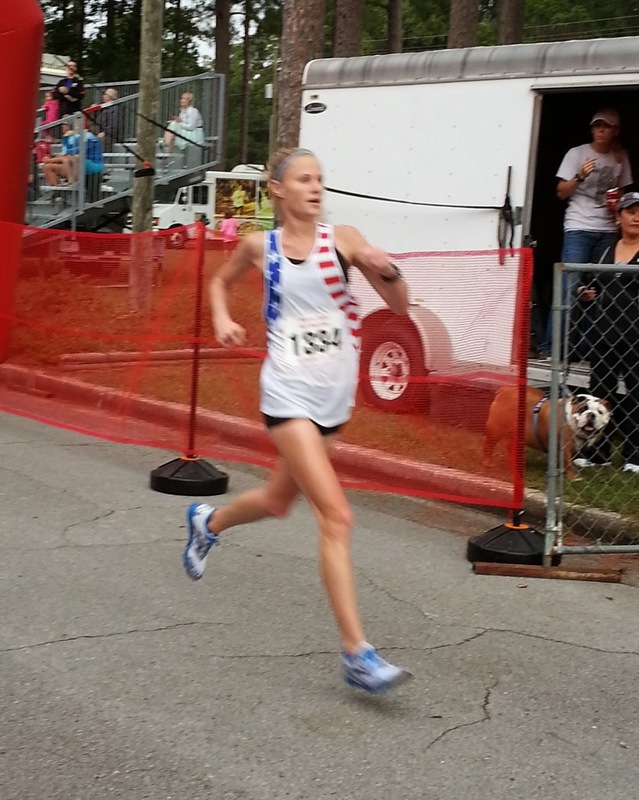 See I had run a tune-up race five weeks previously at the Marine Corps Half Marathon at Camp Lejeune. Given that the conditions were less than ideal (a humid 70 degrees with a little rain shower in the first few miles to get me all sticky) and I had a goal of only running a sub 1:25 (I say only as in comparison to my finishing time of 1:22:36), I started the race a bit on the slower side. I kept waiting for some fatigue to set in, but I hit mile 10 still feeling fresh. I sped up over the next couple of miles, and then – just to prove to myself that I could do it – I ran the final mile in sub-six minutes. I sailed across the Marine Corps Half finish line that day knowing that I was strong enough to complete a sub-three-hour marathon. And a sub-three-hour marathon I did complete…Only problem was that after finishing the race and having the nice medics ice my foot and bring me hot chocolate and soup (If they would have brought me a beer and a pillow, I could have taken a nap right there in the medic tent), I would not be able to walk again for weeks or run for months. And I haven’t completed a race since. While trying to throw together some sort of last minute training for Boston 2014, I complained of posterior shin splints in my right leg. Unfortunately it was not correctly diagnosed until after I tried to race Boston that my shin splints had progressed in to a stress fracture and a stress reaction (two separate areas of my tibia) when an orthopedic surgeon reviewed the x-ray that was taken by a chiropractic practice the Friday before Marathon Monday. 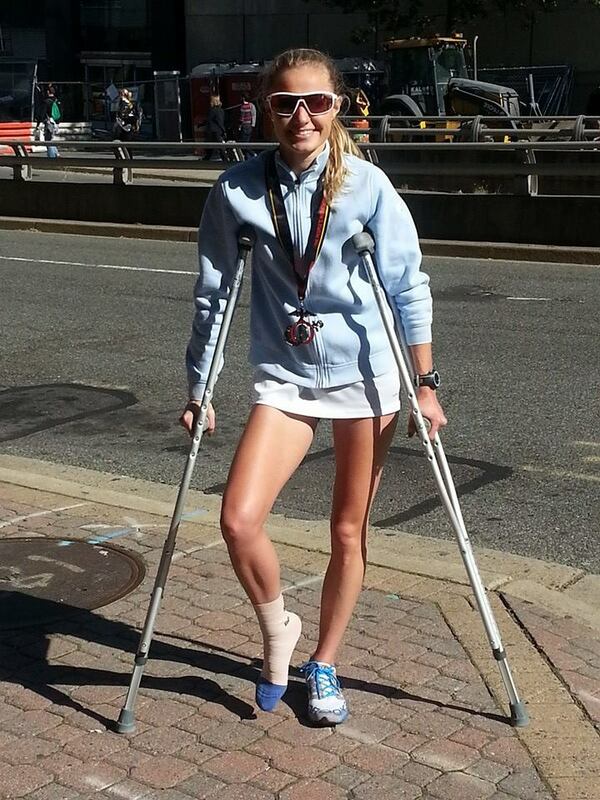 Six weeks after the race, a follow-up x-ray showed that the stress reaction had become a fracture (I believe this happened at Boston) and the other stress fracture (higher up my leg) had healed nicely. But what may have been the orthopedic surgeon’s most important observation (as if I hadn’t noticed) was the obvious and significant atrophy of my calf muscle that was a result of the chiropractors sentencing me to sticks (I’m talking crutches here) and total rest after I limped off the Boston Marathon course at mile 11. Ten weeks after attempting Boston and finally being cleared to run again by the ortho, I completed a short, two-mile run….And felt a million times worse than I ever did before. It would be months before I could experience a run that felt even somewhat normal again. My bone may have been healed, but I was completely broken. I tried really hard. Like REALLY hard to get my leg back functioning properly again. But it seemed that the harder I tried, the more injuries I added to the list. My right leg may have started to begun to feel less like a wooden peg, but funny things were going on with my left ankle, and I couldn’t figure out my on-again off-again hip pain…Seemed the more I stretched – the worse it got! I eventually got bone spurs in both feet, Achilles tendonitis in both legs, and a really annoying case of plantar fasciitis in my left foot (I’ve actually had plantar in my right foot for a long time – I just call it a non-issue.) And even though I was promised it would eventually go away, I still had pain around my lower stress fracture. Things couldn’t get any worse, right? My parents had been nagging me for a while about how I should go to the dermatologist regularly and have all my moles checked, and so I figured after already wasting a nice chunk of change on my running injuries, I might as well drop another couple of hundred on a visit to a derm. Not terribly surprising, there was one somewhat funny-looking mole that the doctor suggested I allow her to remove. It was to be sent for biopsy, but the understanding was that either way, I’ll just see them next year because we took it off. So, when I got the phone call from the dermatologist regarding my biopsy results, I thought the conversation was going in the direction of “Unfortunately, the test results came back and the mole did has some abnormal characteristics so we just need to have you come back in a year for a follow up.” Instead, the words that I was hearing were “Unfortunately, it is melanoma.” The next thing I know, the doctor was telling me about how great the survival rates are these days and how I don’t have to do chemo. I know she meant to be comforting but all I was thinking was WTF….We are talking survival rates? I didn’t even know melanoma was on the table. After I had a few weeks to come to terms with the fact that my 28-year old body had cancer in it, I walked in to my first appointment with the oncologist, and asked him, “This isn’t a big deal, right?” Like I just figured, we’d cut this thing out, and I’d move on. The oncologist looked at me like he was lecturing a teenager on not drinking and driving and told me, “Melanoma is very serious. There is a chance you could die from this.” I wasn’t so convinced…Instead, I thought, I wouldn’t take this guy to a cocktail party…Debbie Downer. I joke about my oncologist, but he is A-game all the way….The entire staff, really, was phenomenal. After my surgery and two weeks of rest (I know he said six…but honestly…my two-inch-long scar on my chest was going to look like crap regardless), I excitedly returned to running in my brand new (very expensive) custom orthotics that I was promised would cure all my ailments including, most importantly, the pain around my old stress fracture that had prevented me from building any kind of decent mileage. But I’m sure you can guess how well they worked out…No Boston 2015 for me. So, I did the stereotypical thing that most runners who have had and healed from a stress fracture do…I went back to my orthopedic surgeon (I’m guessing there’s a huge red alert on my account there to not let me come back any more!). This time he ordered an MRI that was even more expensive than my orthotics, but unfortunately produced the same results – Zero. Nothing. Nada. The best that he could do (and he’s a smart guy) was say that sometimes these things just happen and perhaps I will only be able to run half marathons in the future. I think what he was trying to say is that running injuries can be very difficult to diagnose and discover the true underlying cause of the problem. But I’m sure you can guess how I felt about being told I may not be able run another marathon…The conversation was very similar to the one I had with the oncologist when he told me I should really take is easy for about 9 months to let my body heal….I’m like Yeah – Sure, I’ll run easy…most of the time. No problem. I’m not going to lie, it has been a little scary at times to see how my body, that not that long ago was able to accomplish so much more than I had ever thought it could, fail me…I’ve had months when I couldn’t run a mile, and while I have a great prognosis, it’s still a bit freaky to be told you have cancer and see your survival rates printed in black and white and handed to you. But I don’t plan on dying any time soon, and I have every belief that my best marathons have not yet been run. Sure, I know that there’s a chance I’ll never get back 100% healthy just as there’s a chance I could die from melanoma…But I just wear my sunscreen every day. Every run. And every day I work on getting my body back healthier and closer to being able to train again. I still have a ways to go and I may never fully understand my injuries and their causes, but I believe I am figuring out enough pieces of the puzzle in order to see the picture. To date, I’ve been able to run up to eight miles pain-free, and I have weekly mileage in the twenties…I can’t train for a marathon with that, but it’s proof I’m moving in the right direction. And I relish every step of the comeback. Wow, Paula. You are so inspiring. To go through all of this and still keep your optimism and dedication is just incredible. I’m excited to see where you go (in life and on the blog too)! Paula, what a beautiful yet difficult post. You are a strong woman. Know that if you need anything … I’m always close by. I mean it!